Webmasters: hotlinking is not allowed, please use the post url as download link. - added support of desktop GeForce GTX Titan Z, GT 730, GT 720. - added support of Radeon R9 295X2. - added new OpenGL hardware dependent limits to online score submissions. - GPUs are no longer sorted by bus ID (this sorting was done at the init of FurMark). 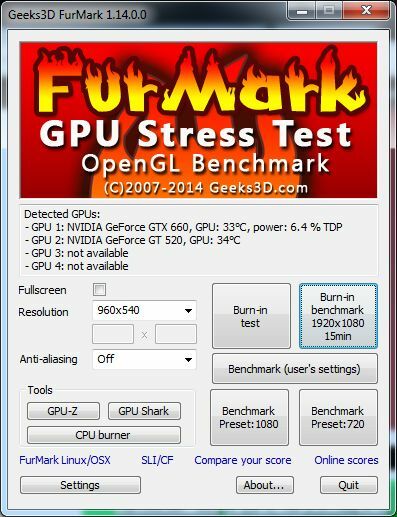 - updated: GPU Shark 0.9.0 and GPU-Z 0.7.9.
i tried again with “FurMark.exe /dyn_camera /NOGUI” it started up and went straight into stresstestmode but with no dynamic camera. I cant figure out how to get this to start automatically (NO GUI) with dynamic camera. Thanks for the test. It’s fixed in FurMark 1.14.1.0 that should be released very shortly.